To ensure all systems perform in line with clients’ requirements, expectations and specification, it is imperative that the installed system benefits from regular service and maintenance by trained professionals. A comprehensive range of preventative maintenance and support contracts provides our customers with a tailored solution that meets their business needs and provides peace-of-mind. Serv has a 24/7 365 callout facility to offer technical telephone assistance and the ability for engineer callouts to defective systems. 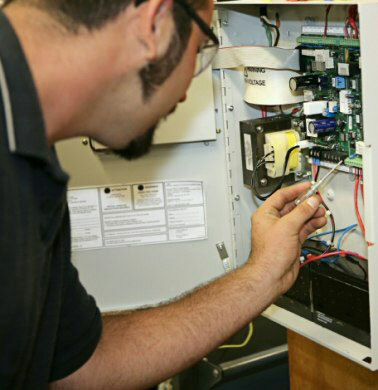 Effective Service and Maintenance can be undertaken on both Serv and non-Serv installed systems. To express our commitment to ongoing quality and service, we have a dedicated Operations Department that is responsible for our service schedule and the deployment of our engineering teams. This ensures our maintenance appointments are completed on time. We inspect, test and maintain systems in accordance with Industry and Manufacturers' recommendations and British and European Standards. In general Serv offer 3 grades of maintenance package to suite different requirements and budgets. Alternatively, call our Customer Services team to discuss your specific requirements and we'll design a bespoke maintenance agreement for you. If you already have security measures in place and just want an unbiased, professional assessment or one-off service, we would be happy to assist.